Boxes are unpacked right away, but then piles of indecision clutter the surfaces. Items are carefully re-boxed and placed for the local thrift store to collect, but then they don’t want your extra sofa after all. Contract painters show up four days early and do a lovely job, creating an unexpected construction zone for weekend entertaining. He was a saint on Friday night, when the long hours, longer commutes, and lack of order finally took their toll on my good humour. The unplanned meltdown was ugly. The picking up and going on was beautiful – suffice it to say that the bedroom, guest room, and living room are all finally pleasant spaces to relax in. On Saturday afternoon, we put together a stew for our guests – friends stopping over with us on the sad occasion of traveling to a funeral. Comfort food seemed called for. A three-pound rump roast was cubed, dredged in flour, and seared. A trio of red onions were diced and cooked in the half-drained drippings, collecting the flavorful leavings and warming their bite. 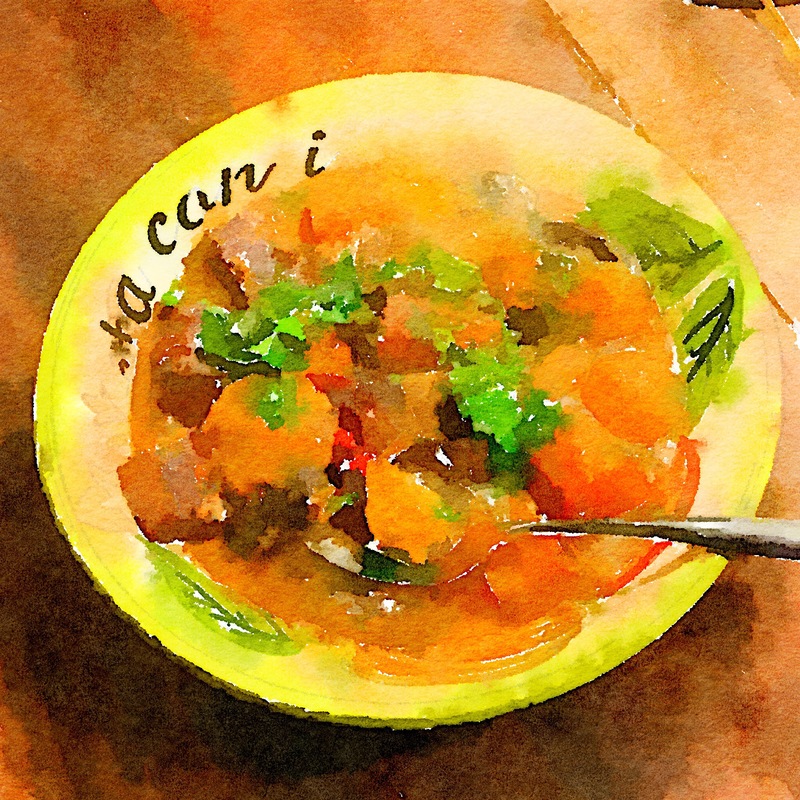 A few ribs of celery, a handful of carrots, and a minced bell pepper were added then the beef was tossed on top. Seasoned liberally with oregano and bay leaf, with two dozen whole peppercorns thrown in for good measure. A palmful of kosher salt. Half a bottle of dry red wine. (He drank a glass, proclaiming it “good” and “very dry”. I can’t stand the stuff; I take my grapes in a sugary cocktail, thanks.) Four cups of well seasoned mushroom stock were poured over all, then the lid went on and the Dutch oven went into the actual oven while we got back to work. Six hours later, the beef was tasty but the broth was inconsistent in appearance and flavor. We set the oven to “warm” and left the pot alone overnight. By Sunday morning, the meat and vegetables were fabulous, but the broth was still a mess – so I set out to repair it. Solids were scooped from the first Dutch oven, drained, and placed into a second one. The liquid was painstakingly ladled into his grandmother’s gravy strainer, one cup at a time, and left to rest for twelve minutes. When the oily bits had risen to the surface, every speck of fat was discarded and the good stuff was saved into a saucepan. Two hours later, with “the good stuff” fully assembled, the now fat-free broth was brought to a low simmer and thickened with corn starch – then poured over the meat and vegetable bits. The whole lot was brought back to temperature, covered, then placed back in the 200 degree oven to stay happy until our (delayed) guests arrived. When they did, baked red potatoes were roughly chopped and placed into shallow bowls. 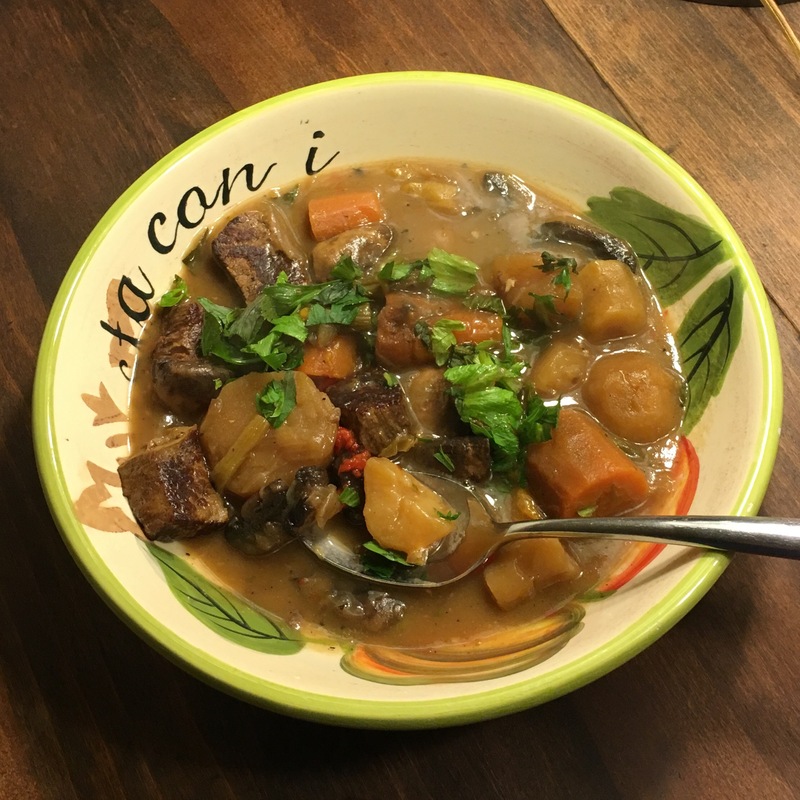 Stew was ladled over top. Seconds were served, along with still and sparkling wines, ginger ales, and plenty of ice cream at dessert. It couldn’t have been better if it had gone according to plan; there aren’t any leftovers to photograph. 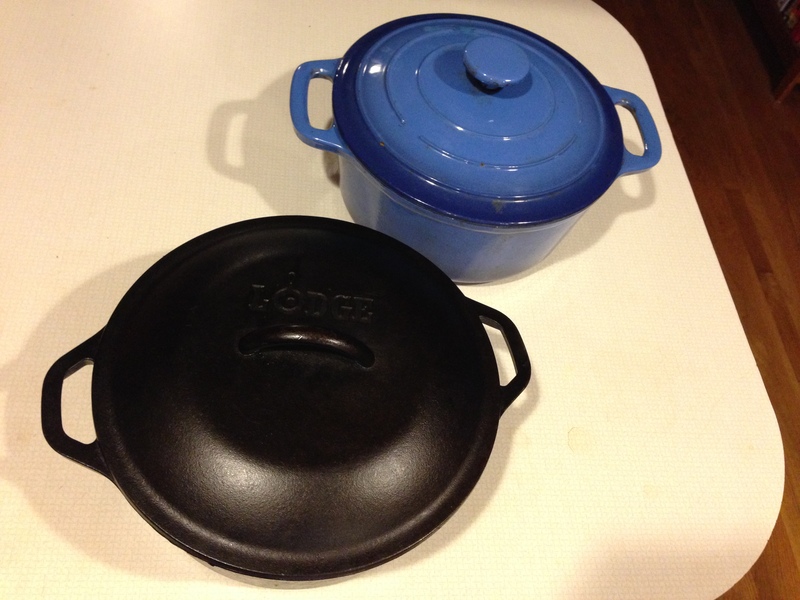 I’m glad to have kept both Dutch Ovens – one enameled, one not.